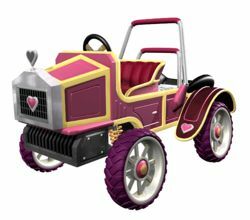 The Heart Coach is Princess Peach's kart in Mario Kart: Double Dash!!. It is a default middleweight kart when the game is first started. It has a heart on the front, instead of Peach's trademark crown. The Heart Coach shows good acceleration with a below average speed. Its weight is tied with Mario's Red Fire and Diddy Kong's Barrel Train. Also, like the Red Fire and Barrel Train, the Heart Coach can dodge large items with ease. When compared to the Turbo Yoshi, however, this kart is lighter, despite sharing the same stats, but it bounces less. 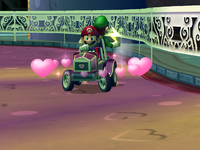 Despite the stats shown in-game, the Heart Coach's acceleration is nowhere near as good as the other four star acceleration karts, only being tied with the Turbo Yoshi's acceleration. Also, both the Heart Coach and Turbo Yoshi accelerate the slowest of all the four star acceleration karts, but they also have the highest top speeds of all the two star speed karts. The Heart Coach, Bloom Coach, Piranha Pipes and Boo Pipes all share the same engine sound. The engine sound is similar as Yoshi and Princess Peach's karts in Mario Kart 64, but with a lower pitch. In addition, the B Dasher in Mario Kart 7 has a somewhat similar sound, but louder. This page was last edited on March 7, 2018, at 09:21.